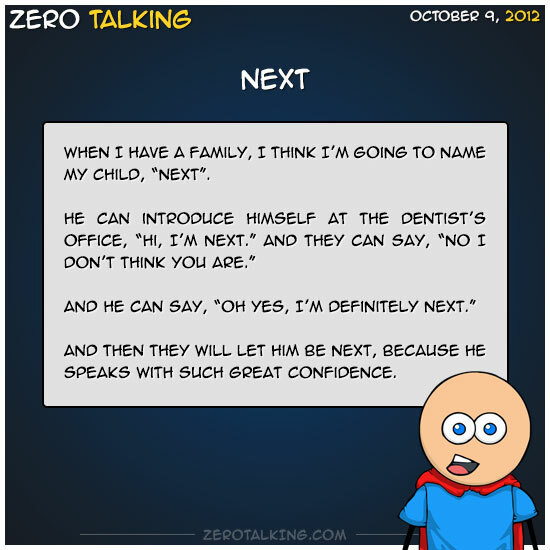 When I have a family, I think I’m going to name my child, “Next”. And then they will let him be next, because he speaks with such great confidence. When I have a family, I’m going to teach my kids to always be nice to birds. And that when they grow up and have children of their own, they should teach their kids the same thing. 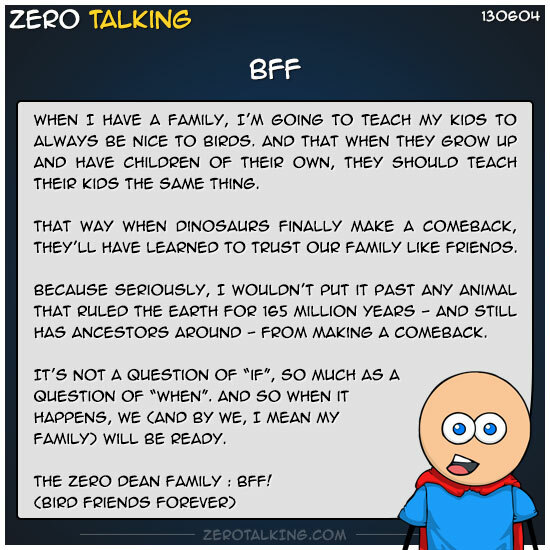 That way when dinosaurs finally make a comeback, they’ll have learned to trust our family like friends. Because seriously, I wouldn’t put it past any animal that ruled the Earth for 165 million years — and still has ancestors around — from making a comeback. It’s not a question of “if”, so much as a question of “when”. And so when it happens, we (and by we, I mean my family) will be ready. 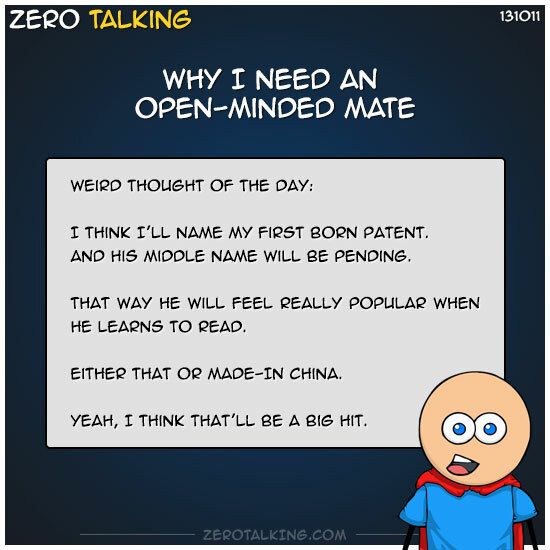 I think I’ll name my first born Patent. 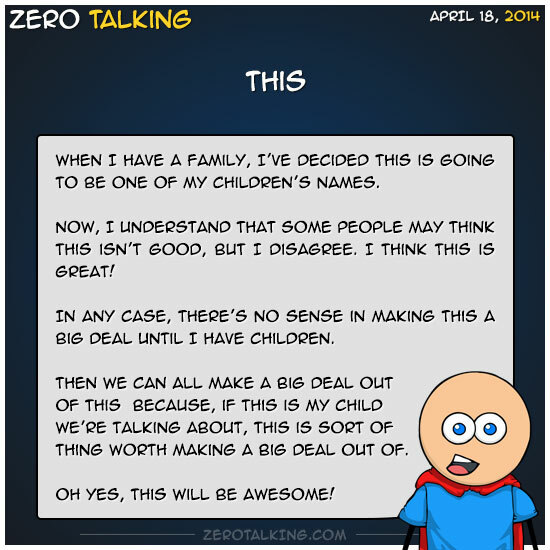 And his middle name will be Pending. That way he will feel really popular when he learns to read. Either that or Made-In China. Yeah, I think that’ll be a big hit. One day when my future children ask me why Daddy always beats them at the games we play, I will have to admit I was practicing long before they were born. And back in 2013, Daddy said “Hi” to oncoming cars on the California freeway just to see if he could say it fast enough to keep up with traffic flow. Hi! Hi! Hello! Hi! Hi there! Hi! Hi! Hi! Hey! Hi! Hi! Hello, stranger! Hi! Hi! 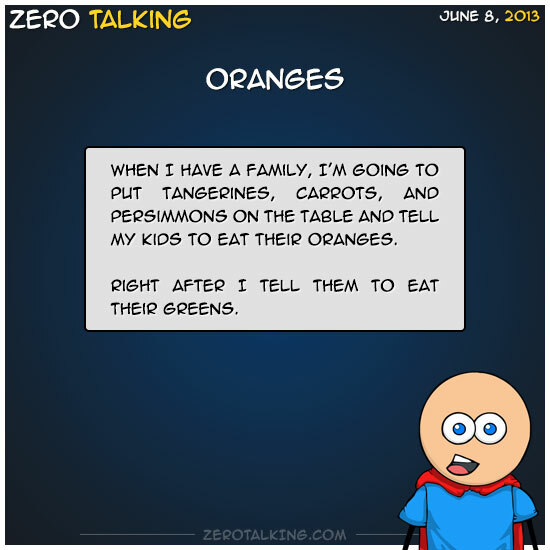 Oh yeah, my kids are done for. When I have a family, I’ve decided This is going to be one of my children’s names. Now, I understand that some people may think This isn’t good, but I disagree. I think This is great! In any case, there’s no sense in making This a big deal until I have children. Then we can all make a big deal out of This because, if This is my child we’re talking about, This is sort of thing worth making a big deal out of. Oh yes, This will be awesome! 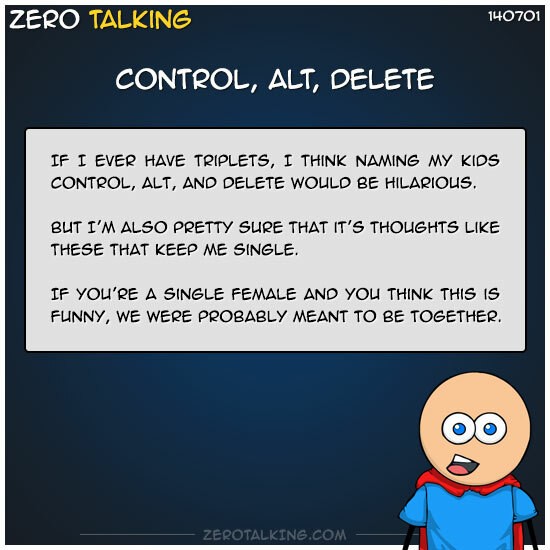 If I ever have triplets, I think naming my kids Control, Alt, and Delete would be hilarious. But I’m also pretty sure that it’s thoughts like these that keep me single. If you’re a single female and you think this is funny, we were probably meant to be together. I used to keep water balloons & silly string in the back seat of my car at all times. But then I thought that was sort of silly, so now I keep them up front for easier access. *I don’t even have kids, but if I ever do, they’re toast. Either that, or they will grow up to be unstoppable. 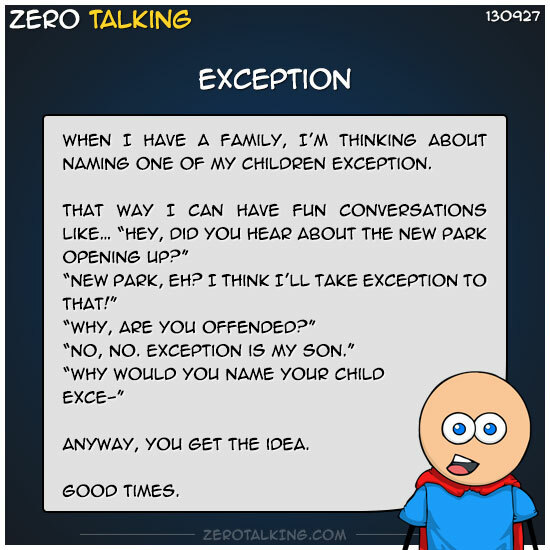 When I have a family, I’m thinking about naming one of my children Exception.